St. John the Baptist school for children in need of special care was established on 9th November 1978 to meet the needs of educating the mentally challenged children. This year the school, has 100 students on roll. The staff consists of 6 trained teachers, 4 crafts teachers and 1 social worker, managing 6 classes and pre-vocational group, grouped according to their IQ and language to the ratio 1:15. This school has a curriculum with a full day school for orals, written work, Maths and activities of daily living in English and Marathi. 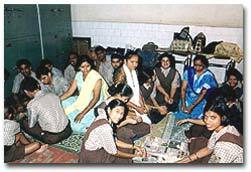 3 rd December 2002 marked the commencing year of our school's 25th year of social service. On the occasion of our Institution's silver jubilee, we hosted an event celebrating world handicapped day. 500 students from 22 school participated. Former principal of St. John, Rev. Fr. Ernest Fernandes graced the occasion with his presence who did the ground work and got the school recognized and aided in the year 1984. Besides, we took our children for handicraft and cultural programmes organized by various institutions in the special Olympics held by AWMH of Maharashtra team at the national level held at Delhi . They won 3 gold, 2 silver and 1 bronze by Amol Bhigardevai, Rupali Ghatge and Salma Sheikh. It was a remarkable achievement. At the District level sports held at Pune, they won 2 silver and 2 bronze. "Sasa chala chandavar" drama performed by our students won the 1st place at the district level organized by Natyashala group on 18th December 2002. Nehru center held a drawing and painting competition, Kamal Dharmani bagged the 1st place. Within a span of 25 years, our school has made good progress. Children have improved considerably because of the hard work of dedicated teachers and volunteers. We are sure that the with continued help and encouragement of all, the school will make greater progress in the near future.